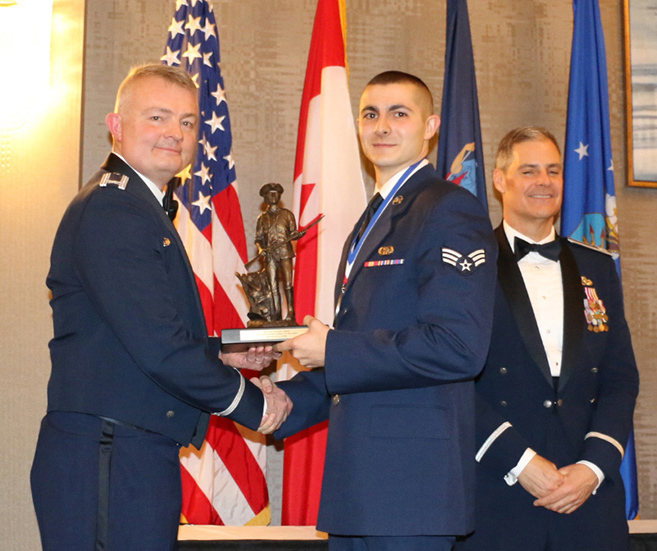 ROME-- Airman 1st Class Nicholas Spine (right) receives the Outstanding Airman of the Year award from Eastern Air Defense Sector Commander Col. Emil Filkorn. Col. John Balbierer 224th Air Defense Group Commander is behind Spine. EADS and the 224th ADG held their annual awards banquet on Saturday Jan. 20 at Hotel Utica in Utica New York.The Eastern Air Defense Sector is responsible for the air defense of the eastern United States and is composed of New York Air National Guardsmen from the 224th Air Defense Group civilians and the Royal Canadian Air Force.